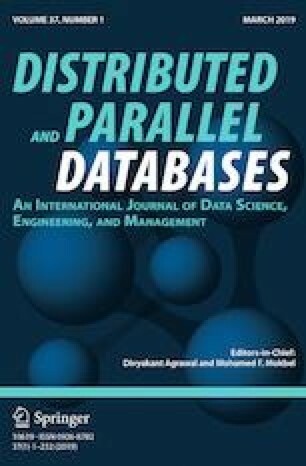 Large scale distributed databases are designed to support commercial and cloud based applications. The minimal expectation from such systems is that they ensure consistency and reliability in case of node failures. The distributed database guarantees reliability through the use of atomic commitment protocols. Atomic commitment protocols help in ensuring that either all the changes of a transaction are applied or none of them exist. To ensure efficient commitment process, the database community has mainly used the two-phase commit (2PC) protocol. However, the 2PC protocol is blocking under multiple failures. This necessitated the development of non-blocking, three-phase commit (3PC) protocol. However, the database community is still reluctant to use the 3PC protocol, as it acts as a scalability bottleneck in the design of efficient transaction processing systems. In this work, we present EasyCommit protocol which leverages the best of both worlds (2PC and 3PC), that is non-blocking (like 3PC) and requires two phases (like 2PC). EasyCommit achieves these goals by ensuring two key observations: (i) first transmit and then commit, and (ii) message redundancy. We present the design of the EasyCommit protocol and prove that it guarantees both safety and liveness. We also present a detailed evaluation of EC protocol and show that it is nearly as efficient as the 2PC protocol. To cater the needs of geographically large scale distributed systems we also design a topology-aware agreement protocol (Geo-scale EasyCommit) that is non-blocking, safe, live and outperforms 3PC protocol. We would like to acknowledge Thamir Qadah for the valuable discussions that helped us to design ExpoDB system. Further, we acknowledge the anonymous reviewers for their useful inputs and comments.